Curtis Martin joined the Jamaica National Building Society in July 2013 as Assistant General Manager, Treasury and Investments. He currently serves as the Managing Director of JN Bank, the commercial banking subsidiary The Jamaica National Group and also Group Chief Financial Officer. The Group Chief Financial Officer oversees the Group financial performance and provides leadership in matters relating to capital structure, dividend policy, capital raising and capital allocation across all companies within The Jamaica National Group. Mr Martin has more than three decades of experience in banking, corporate finance, treasury and investment management. He previously worked in several capacities with the Bank of Jamaica, Pan Caribbean Merchant Bank (now Sagicor), Capital and Credit Finance Group and the Jamaica Money Market Brokers. 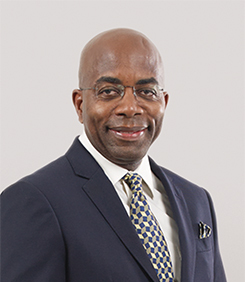 As Chairman of the Jamaica Stock Exchange & Jamaica Central Securities Depository (2006-2011), he led the diversification of the organisation’s revenue stream through the development and launch of the Junior Stock Market, JSE Trustee Services, JSE E-Learning Institute and the Caribbean Exchange Network (CXN).